TODAY MARKS THE 6th anniversary of Malaysia’s first astronaut Datuk Dr. Sheikh Muszaphar Shukor in space. I first wrote about “Angkasawan Day!” (link) a year ago. 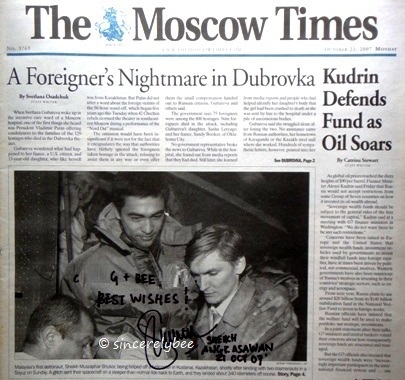 Dr. Sheikh appeared on the front page of The Moscow Times (22 October 2007) after his successful return to Earth on 21 October 2007, a copy which he personally autographed when he dropped by our home on 9 November 2007. 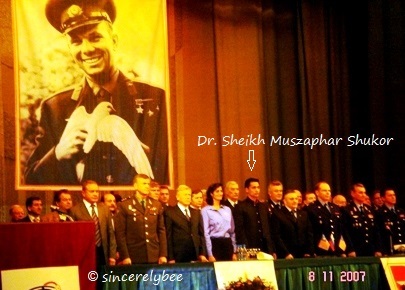 Dr. Sheikh at the Inauguration Ceremony of the Cosmonauts at Star City, Moscow on 8 November 2007; a huge picture of Yuri Gagarin hangs as the backdrop. This entry was posted in Articles, Memories of Moscow and tagged Angkasawan Day, Articles, Moscow, Russia. Bookmark the permalink.